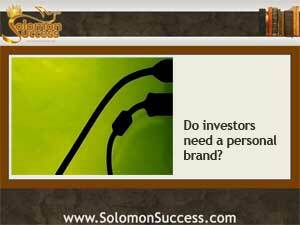 Solomon Success > Blog > Personal Brands: A Tool For Investors? Brands aren’t just for big corporations, luxury cars and fast food places anymore. Job seekers, entrepreneurs and, yes, investors are among the many professional people who need a way to stand out from the crowd. Enter the concept of personal branding – a shorthand way to present your identity to the world. If the idea of building a personal brand makes you think of cattle in the Old West, or the labels on soup cans, think again. Like it or not, we all have a brand – it’s how we present ourselves in the world, and what that says about us. The possibilities are as varied as human beings themselves. What’s new, though, is the growing realization that it isn’t just big corporations that can leverage the power of a distinctive brand. Individuals, too, can develop a brand that reflects a personal or professional identity and leverage that brand to achieve goals. Income property investors are really entrepreneurs, so having a brand helps establish your distinctive identity in the community, to renters, lenders, and everyone you deal with. A brand that’s consistent is easily recognized and communicates instantly key features of the brand holder’s approach to relationships, business decisions and more.